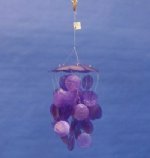 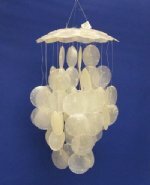 Our Products: Windchimes - Seashell Wind Chimes Wholesale > Small Shell Wind Chimes Under 20"
We have a large selection of colorful small sea shell wind chimes under 20 inches in length, made out of twig hats, wicker hats and capiz shell hats with natural and dyed cockle shells, clam shells, bubble shells, sea urchin spines, sun and moon shells and dyed cut cockle shells. 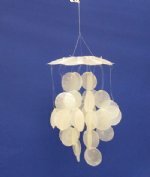 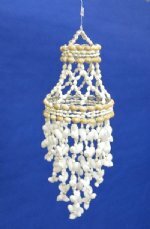 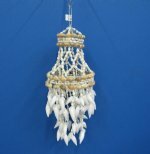 Whether you are selling to customers doing coastal home decorating or to tourists looking for seashell gifts, you must have small seashell wind chimes as they are an extremely profitable item and a must for all souvenir and gift shops. 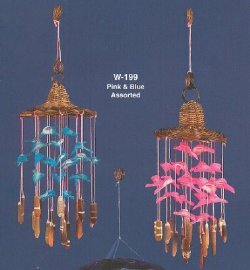 $100 Minimum Order! 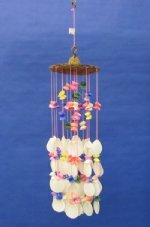 - No International Shipping!